Finding out what your facebook fan page id is simple. All you need to do is follow these steps. REMEMBER: this is optional on Tomoson.com, you can use friends instead with the f connect icon. 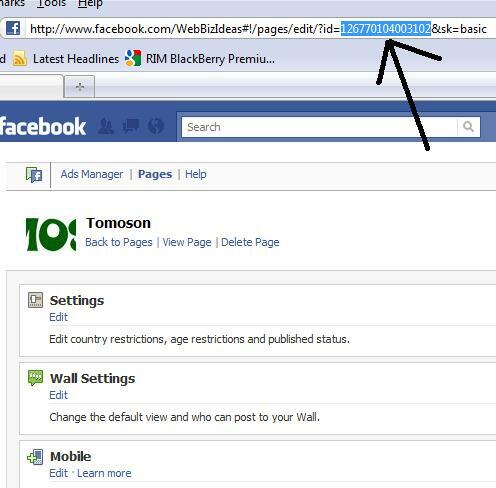 Step 1: Log into your facebook account and click the ads and pages link on the left side. Step 2: Click Edit Page under the page you want to pull the fans from. Step 3: Copy the url at the top of the page next to the equal sign. You can see an example of this below. Once you do that you can paste that into Tomoson and you’re done. ARE YOU STILL GETTING 0 FACEBOOK FANS? Here is something you can try. Solution for this problem might be: Set your “Age Restrictions ” in the Page “Settings” to “Anyone +13”. This will get rid of your error message. This public profile is not visible.